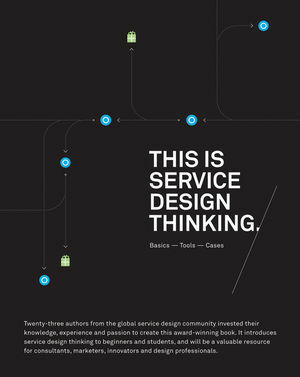 Service design thinking is the designing and marketing of services that improve the customer experience, and the interactions between the service providers and the customers. If you have two coffee shops right next to each other, and each sell the exact same coffee at the exact same price, service design is what makes you walk into one and not the other. Maybe one plays music and the other doesn't. Maybe one takes credit cards and the other is cash only. Maybe you like the layout of one over the other, or one has more comfortable seating. Maybe the staff at one is friendlier, or draws fun shapes on the top of their lattes. All of these nuances relate to service design. At the end, a one-page "Customer Journey Canvas" is included, which can be used to quickly sketch any service on a single sheet of paper—capturing different stakeholder concerns: e.g. customers, front-line staff and management. Marc Stickdorn (Austria; http://thisisservicedesignthinking.com; www.destinable.com) is co-founder of Destinable, a consultancy specializing in service design for tourism, and lectures around the world at business and design schools. He is a professor at the Management Center Innsbruck in Austria, where he lectures on service design and service innovation. His main areas of interest are service design and strategic marketing management particularly in a tourism context. Jakob Schneider (Germany) is a graphic designer based in Germany.